Farrar, Straus and Giroux, 2014. In 2004, four low-income Mexican-American high school students from Phoenix built an ingenious robot for a science competition that pitted them against teams from top colleges, including the Massachusetts Institute of Technology. The story sounds almost too “Hollywood” to be true, and in fact, it has already inspired a documentary and a feature film. 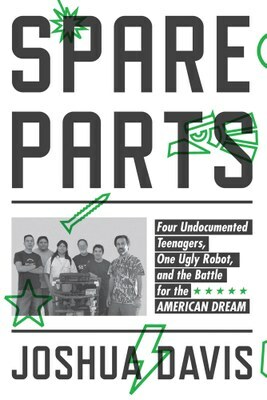 But seasoned journalist Joshua Davis sticks to the facts in his original book, Spare Parts, carefully reconstructing how these ESL students, “caught in the tractor-beam pull of poverty and low expectations,” became one of the top underwater robot teams in the country. Davis opens with officials from the NASA and Navy-sponsored Marine Advanced Technology Education Robotics Competition grilling the team members. “These kids had shown up with a garishly painted plastic robot that was partially assembled from scrap parts,” Davis writes. “They called their creation Stinky because it smelled so bad when they glued it together.” And yet “Stinky” manages to outperform the sophisticated work of MIT’s best underwater robotics team. Davis then draws back to tell us about the robot’s creators, illustrating just how improbable it was that these teenagers ever managed to enter this competition. All four were brought to America from Mexico by their parents as children, and only one of them held a green card. Oscar Vasquez excelled in ROTC until he realized that his undocumented status would get in the way of a military career, while Cristian Arcega is a tinkerer with a sharp engineering mind. Lorenzo Santillian joins the robotics team as a way to escape a gang, and Luis Arranda is a taciturn hulk. They are fortunate in their teachers, Iranian immigrant Fredi Lajvardi and former Navy electronics technician Allan Cameron, who encourage their quest. These Mexican-American students from Phoenix, who won an underwater robotics contest in 2004, against MIT, are the subjects of the book Spare Parts. Davis’ prose is straightforward, but he’s skillful at creating atmosphere and building suspense. You’ll find yourself whipping through the pages to learn what happened — especially how the kids’ lives turned out after the contest. Davis describes how Lisa Spence, one of the contest judges, felt when she first met the four boys: “As a NASA employee, she had become accustomed to working with engineers who conformed to a sort of industry standard: white, well educated, conservative clothes. These four teenagers standing in front of her signaled that the future looked different.” One can only hope that this book leads people to question the wisdom of deporting American-raised children of immigrants — especially high-achieving engineering whizzes like these.